This work is dedicated to David W. Crippen, MD, FCCM, who, literally, made it possible. The computers this work was written on, the myriad books and journals consulted, and the liaison with many of the professionals required for such work were all directly facilitated by Dave Crippen. But, these are the least important elements he contributed. By far the most critical ingredients were and are his faith and friendship. For these he has my unending thanks. Intellectual Property Rights: The intellectual property rights to the technology of liquid assisted pulmonary cooling (heat exchange) (LAPC or LAPHE) using combined gas and fractional tidal liquid ventilation are controlled by Critical Care Research, Inc., under US Patent 6,694,977, “Mixed-mode liquid ventilation gas and heat exchange.” Inquiries regarding access to this technology should be directed to Critical Care Research, Inc., 10743 Civic Center Drive, Rancho Cucamonga, CA 91730-3806. Telephone: (909)987-3883. Liquid assisted pulmonary cooling (LAPC), or liquid assisted pulmonary heat exchange (LAPHE) will not likely be applied in the West any time in the foreseeable future for many reasons; not a few of them having to do with regulation and consumer perception of what constitutes acceptable risk versus benefit. There is an ancient Chinese curse: “May you live in interesting times and come to the attention of important people.” The medical-molecular equivalent is: “May you be synthesized in interesting times and come to the attention of important medical (and environmental) bureaucrats.” This perfectly describes the fate of the medically useful liquid PFCs. They are dramatic molecules and they are at once both therapeutically paradigm changing and physiologically outrageous. There is a strong emotional reaction – one part wonder and one part shock – at seeing a patient’s lungs filled up with liquid, any liquid. Bulk liquid does not belong in mammalian airways, and in every clinical instance where it occurs, or is introduced into the lungs – in pulmonary edema, drowning and inhalation of organic liquids – it is an unmitigated disaster. The ‘breathable’ PFCs thus attracted a lot of attention. So, PFCs had this strike against them, and they came about as putative therapeutic agents in ‘interesting’ times in the most Chinese sense of the word. The explosion of technological innovation that has occurred since the Industrial Revolution has brought not only powerful advantages, but also often damaging and not infrequently frightening downsides. We live in an age when people, at least in the West, have become acutely sensitized to the dark side of technology and increasingly unwilling to accept risk unless it is precisely quantified, small, and will almost certainly not affect them. The PFCs present some unfortunate challenges in this regard. First, while they are among the most chemically inert substances known to man, they are biologically active in fentogram quantities. Most of the medically useful PFCs abolish white blood cell chemotaxis in picogram to fentogram concentrations. While their very inertness and lack of chemical reactivity make them indispensable as a liquid ventilating medium, these same properties mean that, should they escape the lungs due to pneumothorax (and enter the mediastinum or other closed body viscuses or capsules) they will likely remain there for the rest of the patient’s life. This may seem ample reason to eschew these molecules as therapeutic agents. However, I believe these facts must be taken in the context of how we use and abuse similar (and in some cases nearly identical) molecules both in medicine and in our daily lives. Introducing liquid into patients’ lungs will never be a trivial matter, or something undertaken lightly. Such therapies and their enabling molecules will not be broadly used (or abused) in medicine. Indeed, their use is necessarily confined to the emergency medical and critical care setting in intubated and mechanically ventilated patients. Foreseeable off-label medical use of neat PFCs is virtually nil. And yet, these molecules will ‘seem unlikely to be approved for medical use in the West in foreseeable future. All of the existing molecules are either unsuitable for use in the induction of hypothermia (such as Perflubron™ which freezes at +6 deg C) or are chemically heterogeneous, as I explain in this manuscript. It would thus be necessary to synthesize and purify new classes of molecules and then vet them individually for safety and efficacy. The cost of doing this is more than any Western drug company could bear when weighed against even the most optimistic projections of financial return on the investment. There is very little place for a drug that a patient will use once during a lifetime and that, if it works, will leave him more than able to sue all involved in its application to him should he develop some adverse effects, even if these occur only after decades of additional, healthy and productive life which would not have been possible otherwise. I hasten to add that I do not think the PFCs will be free of long term side effects. Most of the chronic survival dogs in our studies that underwent PFC ventilation and/or cooling have since grown old and died. We saw nothing unusual; they died of heart failure, cancer and the usual things old dogs die of, and seemingly at the usual rates, and at the usual ages. But, our sample size was ‘microscopic;’ and I think it likely that large populations of people treated with PFCs may have a statistically significant increase in conditions related to the immunomodulating and immunosuppressive effects of these molecules; possibly more infections, more serious infections, and more neoplasms. My answer to that is, ‘so what?’ We accept adverse effects in oncology, chronic hemodialysis, chronic circulatory support (left ventricular assist devices) and solid organ transplantation that are, by comparison, the stuff of nightmares. We know and accept that children who are given radiation and chemotherapy have a good chance of surviving many childhood cancers, but very often at the expense of lowered IQs and a lifetime complicated by greatly increased risk of infection and of cancers unrelated to their original diagnosis. The liquid ventilating PFCs are benign compared to OTC aspirin which claims ~50,000 lives each year; mostly in treating nothing more life threatening than the pain of osteoarthritis, headaches and joint and muscle pain. And yet, the PFCs will not be approved for liquid ventilation or heat exchange applications in the foreseeable future; not here in the US, and not anywhere else in the West. In the Russian Federation these very same molecules are approved and are being used parenterally in the form of any oxygen carrying ‘blood substitute’ called Perftoran. It isn’t the best such oxygen therapeutic possible (Alliance’s Oxygent™ was far superior), but it works and it is an acceptable risk; at least Russians physicians and regulators think so (and for what it is worth, I agree). The Chinese, vastly more Westernized than the Russians, have still to approve the first PFC-based blood substitute (or liquid ventilating media, for that matter). Nevertheless, it will be in one of these places, or someplace like them, not in the US, Australia or Europe, where LAPC/LAPHE is first clinically applied. So, the information present here will necessarily be of mostly theoretical interest. Hopefully it will find distribution in parts of the world where it will be of some practical value as well. 21CM = 21st Century Medicine, Inc.
CCR = Critical Care Research, Inc.
HNCL = hyperinflated non-collapsible lungs; a condition thatoccurs when PFC becomes trapped in the alveolar surfactant layer. IL = interleukin as in IL-1, IL2, etc. LAPC = liquid assisted pulmonary cooling is a heat-exchange modality in whichventilation occurs via both gas and liquid ventilation proceeding concurrently. At this time the principal treatments for SCA consist of initiation of manual, ‘bystander’ cardiopulmonary resuscitation, so-called Basic Cardiac Life Support (BCLS or BLS) followed by ‘definitive’ treatment of the arrhythmia beginning with defibrillation and the application of Advanced Cardiac Life Support (ACLS or ALS). 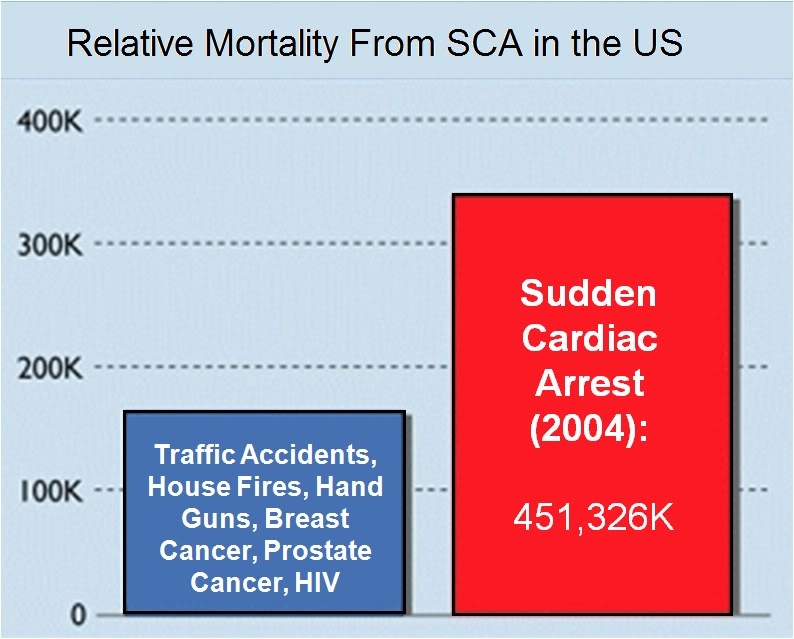 Figure 1-1 (right): Mortality from sudden cardiac arrest (SCA)in 2004 as a result of myocardial infarction compared to death from other ‘high profile’ causes of mortality in the US. ACLS consists of the application of an algorithm of manual CPR, electrical defibrillation and pharmacologic therapy aimed at restoring a perfusing cardiac rhythm and adequate blood pressure and cardiac output to sustain life until definitive treatment of the underlying cause of the cardiac arrest can be achieved (e.g., coronary revascularization, implantation of an automatic defibrillator, or life-long anti-arrhythmic therapy). Figure 1-2 (right): Probability of survival as a function of time following cardiac arrest. 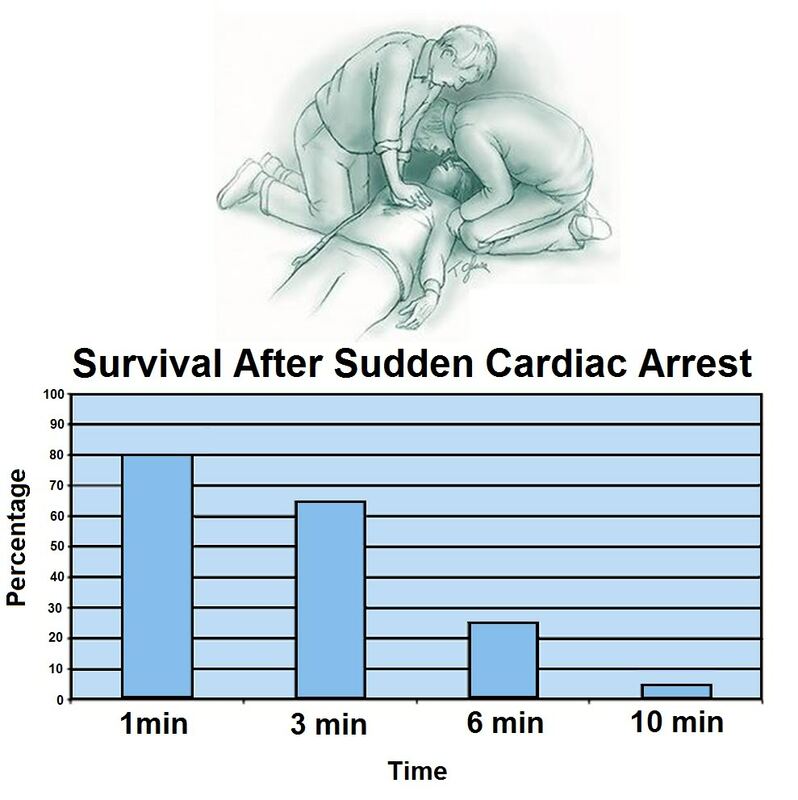 As is shown in Figure 1-6 below, the time to survival without neurological deficit following cardiac arrest in the absence of BCLS declines rapidly following a sigmoid curve with survival without neurological deficit being ~80-90% following 1 minute of arrest time, and less than 10% following 9 minutes of arrest. Put another way, 50% of patients will experience significant morbidity or death following 4 minutes of circulatory arrest (Figure 1-2). The condition of the typical sudden cardiac arrest (SCA) patient and the circumstances under which he experiences cardiac arrest are far from the ideal of a patient who is a candidate for emergency cardiopulmonary bypass (CPB) in hospital. The typical SCA patient is middle aged or elderly, often suffering from one or more co-morbidities (diabetes, obesity, COPD, hypertension), and if subjected to prolonged CPR will invariably have impaired gas exchange due accumulation of fluid in both the parenchyma and the air-spaces of the lungs (pulmonary edema with alveolar flooding). This occurs because closed chest CPR quickly causes pulmonary edema., As previously noted, even when the SCA patient is a ‘good’ candidate for salvage; someone who is relatively young and free of co-morbidities, CPR will likely prove futile due to cerebral ischemia-reperfusion injury and the post-resuscitation syndrome. Since the demonstration by Safar, et al., of the neuro-salvaging effects of mild systemic hypothermia after prolonged cardiac arrest in dogs , there has been an explosion of translational research which has lead to a transformation in our understanding and application of mild hypothermia.,  Once seen solely as a protective tool which conferred benefit by reducing metabolism, it has become clear that mild hypothermia (33°C–35°C)  has therapeutic effects which appear to be primarily anti-inflammatory and anti-apoptotic in nature, and which operate independently of hypothermia’s effect on metabolic rate., Table 1-1 reviews some of the known pro-inflammatory factors inhibited or moderated by mild therapeutic hypothermia (MTH) and documents the supporting literature. AIF, apoptosis-inducing factor; BBB, blood–brain barrier;; HSP-70, heat-shock protein-70; iNOS, inducible nitric oxide synthase; intra, intraischemic hypothermia; MMP-9, matrix metalloprotease-9; M, mouse; NF-kB, nuclear transcription factor kB; NOS, nitric oxide synthesis; nNOS, neuronal nitric oxide synthase; PKC, protein kinase C; PMNL, polymorphonuclear leukocytes; post, postischemic hypothermia; R, rat; S, species; T(1C), intraischemic temperature, unless specified; TNF-a, tumor necrosis factor-a. Reproduced with modifications from Zhao, H., Steinberg, GK, Sapolsky, RM., General versus specific actions of mild-moderate hypothermia in attenuating cerebral ischemic damage. J Cerebr Blood Flow Metab, 2007. 27: p. 1879-1894. Table 1-1: Intraischemic hypothermia delays or attenuates both ATP depletion (Ibayashi et al, 2000; Sutton et al,1991; Welsh et al, 1990) and anoxic depolarization (Bart et al, 1998; Nakashima and Todd, 1996; Takeda, et al, 2003), it also blocks glutamate release (Busto et al, 1989b; Patel et al, 1994; Winfree et al, 1996), suppresses inflammation (Kawai et al, 2000; Wang et al, 2002), maintains the integrity of the BBB (Dietrich et al, 1990; Huang et al, 1999; Kawanishi, 2003), reduces free radical production (Maier et al, 2002), inhibits protein kinase C translocation (Cardell et al, 1991; Shimohata et al, 2007a, b; Tohyama et al, 1998), inhibits matrix metalloproteinase expression (Hamann et al, 2004), and blocks both necrosis and apoptosis. Intraischemic hypothermia also preserves the base-excision repair pathway, which repairs oxidative damage (Luo et al, 2007). In addition to those cascades directly associated with neuronal injury, hypothermia further blocks astrocyte activity and inhibits white matter injury (Colbourne et al, 1997; Dempsey et al, 1987; Kimura et al, 2002). Similarly, postischemic hypothermia blocks free radical generation (Horiguchi et al, 2003), attenuates inflammation (Horstmann et al, 2003; Ohta et al, 2007), prevents BBB permeability (Preston and Webster, 2004), and suppresses caspase activities (Van Hemelrijck et al, 2005). Indeed, a browse through the literature gives an overwhelming impression that hypothermia seems to block every damaging event associated with necrosis or apoptosis. One reason for this impression of pan-inhibition may lie in the causality of ischemic damage. For example, is the inflammatory response the cause of tissue damage or is it induced by brain injury? If it is the latter, then since hypothermia prevents tissue damage, it certainly also prevents the inflammatory response. – Zhao, H., Steinberg, GK, Sapolsky, RM., General versus specific actions of mild-moderate hypothermia in attenuating cerebral ischemic damage. J Cerebr Blood Flow Metab, 2007. 27: p. 1879-1894. The journey from the laboratory to the clinic for MTH has been long and difficult. Seven years after the publication of the prospective randomized trials clearly showing that MTH improves survival and neurological outcome in out-of-hospital cardiac arrest patients, and 6 years after the ILCOR and AHA Guidelines  recommended that: “Unconscious adult patients with spontaneous circulation after out-of-hospital cardiac arrest should be cooled to 32°C to 34°C for 12 to 24 hours when the initial rhythm was ventricular fibrillation (VF),”  only a minority of SCA patients are being treated with MTH. In surveys of emergency and critical care physicians conducted in 2005 and 2006, 74% of those responding in the US  and 64% of the international respondents indicated they had never used MTH., The use of pre-hospital, in-field MTH, is virtually nonexistent. 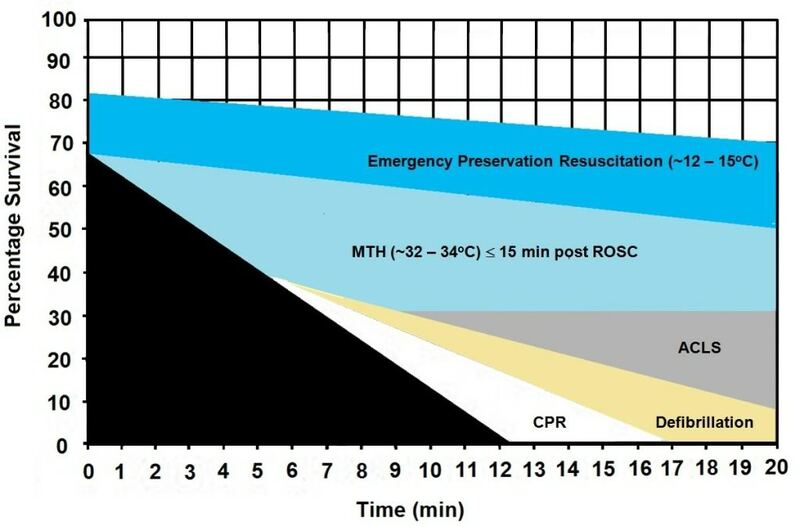 Figure 1-3: The impact of a delay of 10 min in inducing MHT is a dog model of cardiac arrest followed by 3 min of systemic ischemia, 7 minutes of mechanical CPR and 50 minutes of advanced life support. Hypothermia to 34oC was induced beginning at 10 min post arrest in the early hypothermia group and at 20 min post arrest in the delayed hypothermia group ¢. In the early hypotherrmia group group, 5 of 7 surviving dogs were functionally normal (OPC 1 or 2), 1 had OPC 3, and 1 had OPC 4 (coma) at 96 hours of recovery. Histologically, 4 of 8 dogs in this group were normal (HDS 0), 1 had HDS 16, 1 had 22, and 1 had 98. The only surviving dog in the DH group was functionally normal at 96 hours (OPC 1, NDS 0) with an HDS of score of32 (mild injury) Due to early mortality only two other dogs in the delayed hypothermia group were evaluated histologically and their HDS scores 38 and 45, respectively. Dogs in this study were scored by ‘overall performance categories’ (OPC; 1=normal, 2=moderate disability, 3=severe disability but conscious, 4=coma, and 5=death) Neurological function and neurological deficit scores (NDS; 0% to 10%=normal, 100%=brain death). , Histological damage scores were obtained by neuropathological examination of 19 distcrete brain regions for severity and extent of ischemic neuronal changes, infarcts, and edema. A total brain histological damage score (HDS) >40 represented moderate damage, and HDS >100 represented severe damag. 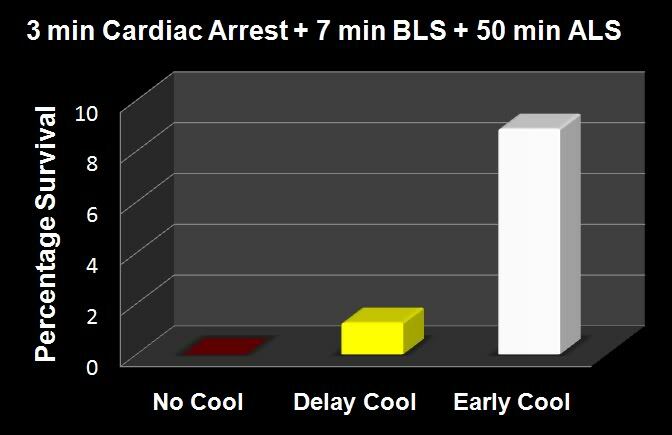 Redrawn from Nozari, A., et al., Critical time window for intra-arrest cooling with cold saline flush in a dog model of cardiopulmonary resuscitation. Circulation, 2006. 113(23): p. 2690-6. The primary obstacle to realizing this bonanza in translation research has been the practical impossibility of achieving systemic cooling within the narrow therapeutic window demonstrated in animal models of SCA and resuscitation.,,,,,, If the clinical outcome of MTH was even half that achievable in the laboratory, widespread application would likely have been rapid and uniform; there is rarely resistance to the ‘miraculous’ if it is simple, easy to understand, biophysically well characterized and highly cost-effective. MTH applied immediately post ROSC would be all of these things. Figure 1-4: The results of the Nozari, et al.,  study on the effects of delayed MTH are presented graphically at right with the addition of historical controls from the literature treated similarly, but with no hypothermia (no survivors). 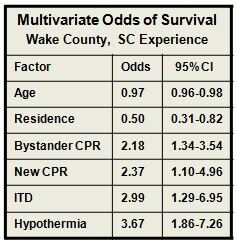 This graphic illustrates the potency of truly rapid post arrest hypothermia in ncreasing survival. Figure 1-5: Results of a study of 48 cardiac arrest patients treated with MTH via endovascular cooling. A strong correlation was found between rapidity of cooling and both neurological outcome and serum neuron specific enolase levels. Left: Time course of MTH among patients with good and poor neurological outcome. The curves indicate the course of mean body core temperature during MTH among patients with good (¢) and those with poor (p) outcome as well as in the entire (▬) patient group. Right: Correlation between time to coldest temperature (minutes) and the maximum NSE values (μg/L). Normal serum NSE is 9.6±0.7 μg/L. 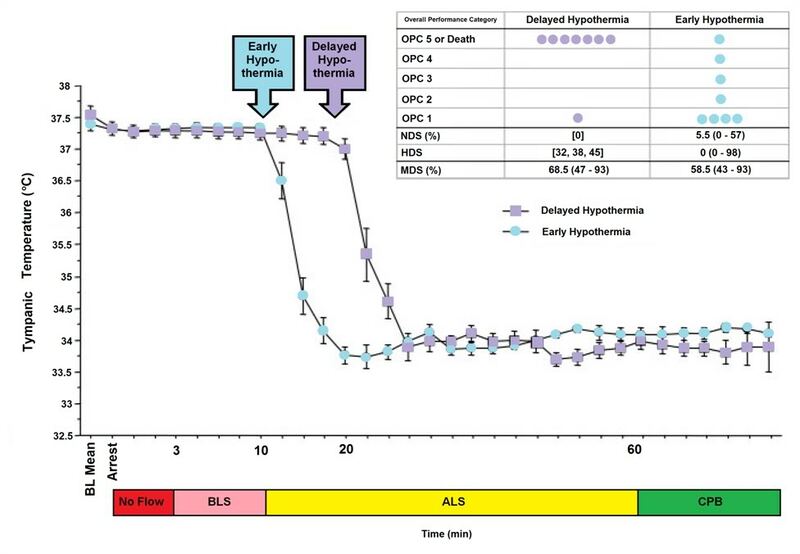 Redrawn from Wolff B, et al., Early achievement of mild therapeutic hypothermia and the neurologic outcome after cardiac arrest, Int J Cardiol (2008). begun until 20 min post arrest in the delayed hypothermia group (DH group) which consisted of 8 dogs. Target core temperature was achieved at 6.0±2.7 minutes after the initiation of cooling (3.5 minutes after the start of veno-venous cooling) in both groups. The delay from arrest to reaching ~34oC was 16.6 min in the EH group and 25.4 minutes in the DH group. The dramatic efficacy of MTH in the laboratory made quick converts of the pioneering researcher-clinicians who forged ahead with the application of MTH to SCA in the clinic precisely because it was dramatic; indeed it was as close to the miraculous as interventions in medicine come. The real barrier to translating that ‘miracle’ to everyday practice has been the seemingly intractable problem of achieving cooling over the same time course that has proven so effective in the research setting. The problem is that the optimum therapeutic window for the treatment of cerebral ischemia-reperfusion injury appears to be in the range of 0 to 15 minutes post ROSC. One of the first follow-up studies on MTH carried out by Safar, et al., demonstrated that in a standardized model of cardiac arrest in dogs a delay in the application MTH of as little as15 min after ROSC abolished most of the benefit., While the work of Bernard, et al.,  and that of the Hypothermia after Cardiac Arrest Study Group  demonstrated that delays in cooling of up to 2-3 hours post ROSC in humans still have sufficient clinical utility to justify the routine application of MTH in a selected group of SCA patients, this benefit is marginal when contrasted to that achievable in the laboratory when MTH is rapidly induced during the first 15 minutes after ROSC. Thus, the optimum clinical benefit of MTH in ischemic and very likely traumatic, CNS injury requires the ability to achieve very rapid core cooling. In the clinical arena the time to reach the target core temperature under ‘good’ circumstances is in the range of 3-4 hrs; not 10 to 30 min, as is the case in the laboratory. Even with such long delays in cooling the adverse effect of delay is still present. Wolf, et al., recently published a study of 49 out of hospital cardiac arrest patients who were treated with MTH (32.0-34.0°C; with a target temperature of 33.0°C) of 24 h duration using endovascular cooling. The study endpoints were neurological outcome on discharge from hospital and serum neuron specific enolase (NSE) levels (a sensitive and specific marker of neuroinjury) at 24 h intervals to 3 days (Figure 1-5). NSE levels were found to correlate well with the time required to reach the lowest temperature achieved in each patient (Figure 1-5). Even with delays in the start of cooling that averaged 2.5 hrs; and a mean time to reach target core temperature of 6.8 hrs, additional injury accruing from slowness in cooling was still clinically and biologically apparent. Despite the homogeneity of the patients, their arrest times, and their course of treatment, ~60% of the patients in this study either did not survive, or were comatose or PVS. To understand the benefits and limits of MTH when it is aggressively and competently implemented with currently available technology, it would be hard to find a better example than that of Wake County, SC. Wake County, is located in the northeast central region of North Carolina and is part of the Research Triangle metropolitan area, which consists of Raleigh, Durham, Chapel Hill, and surrounding urban and suburban areas. The area serviced by the Wake County Emergency Medical System (Wake EMS) has a population of 832,970 (as of 2007). The Wake County EMS operates 35 ambulances from 23 locations with 825 ALS personnel; ambulances are staffed with two paramedics 95% of the time and there is always one paramedic responding. In 2002 the Wake EMS answered more than 50,000 medical requests for service. Based on the latest national data Wake County ranks third in the US for recovery from “survivable” cardiac arrests (primarily ventricular fibrillation-ventricular tachycardia). Nationally, the average survival rate is 17% for patients presenting with these arrhythmias. Figure 1-8: Improvement in overall survival of patients in cardiac arrest in response to the phased introduction of CPR per AHA 2005 Guidelines, use of an impedance threshold device (ITD) and in-field induction of MTH. Beginning in January 2004 Wake EMS initiated a study to evaluate the efficacy of CPR as they then practiced it, and to evaluate the effectiveness of the impending change in the American Heart association (AHA) guidelines for CPR, the introduction of an impedance threshold valve (the ResQPod™) and Wake EMS’ planned implementation of the ILCOR Guidelines for post-arrest MTH., From January 2004 until April of 2005, Wake EMS personnel employed the then extant AHA guidelines, which mandated an emphasis on intubation and a 15:2 compression-to-ventilation ratio; with interruption of chest compressions for ventilation. This period constituted the baseline of the study, and data were collected per protocol; not gathered retrospectively. 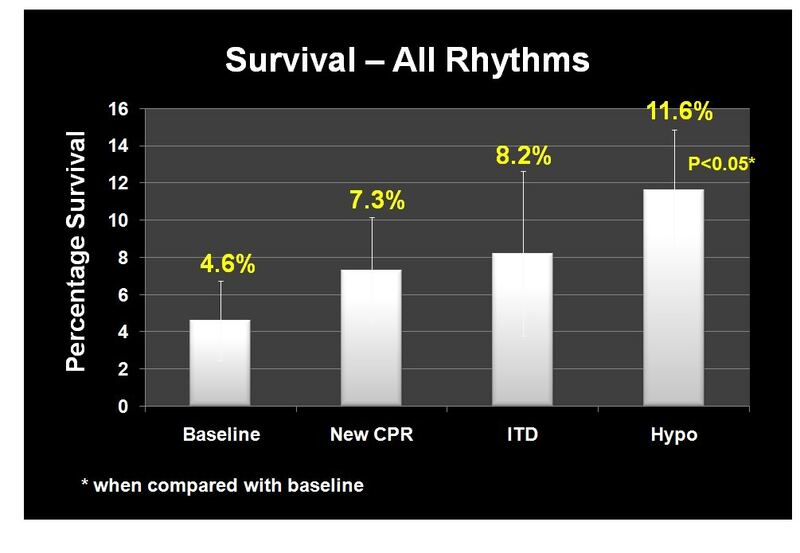 During the baseline period survival to discharge from hospital was 2.4% for all patients given CPR and 12.1% for patients with ventricular fibrillation-ventricular tachycardia (VF-VT) arrhythmias. In April 2005 Wake EMS implemented continuous cardiac compression CPR with a 30:2 compression-to-ventilation ratio with emphasis on no, or very minimal, interruption of chest compressions. After 12 months, the overall survival rate had risen to 4%; and had more than doubled to 21.8% for patients who presented in VF-VT. In April 2006, Wake EMS added the use of an impedance threshold device (ITD) to improve cerebral and coronary perfusion during CPR. Introduction of the ITD resulted in an increase in overall survival to 4.5% and an increase in the survival of patients with VF-VT to 28.5%. 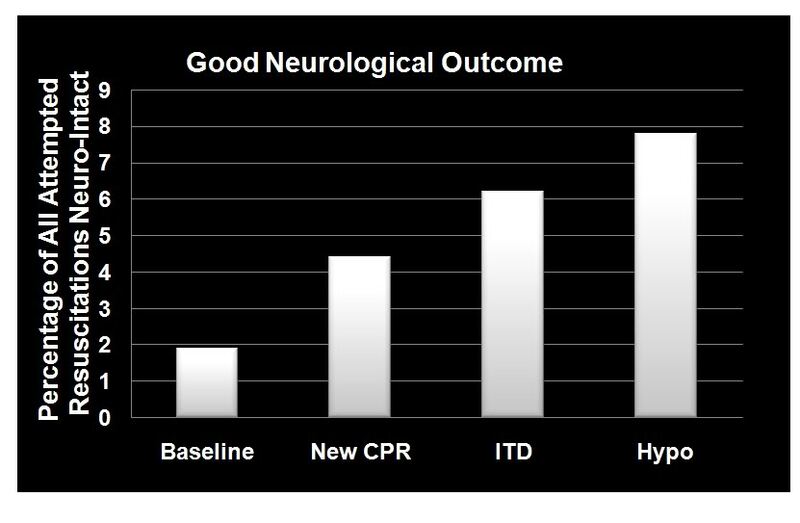 Figure 1-9: Dramatic improvement in neurologically intact survival as a result of the phased introduction of CPR per AHA 2005 Guidelines, use of an impedance threshold device (ITD) and in-field induction of MTH. The final phase of the investigative protocol began in October of 2006 when Wake EMS added in-field induction of MTH to the two previous interventions. MTH was induced using a combination of external cooling employing ammonium nitrate-water eutectic ‘instant cold packs’ applied to the axilla and groin, and cold IV saline (1-2oC, 30mL/kg to a maximum of 2 liters) given rapidly via two large bore catheters and/or intraosseous infusion. Criteria for induction of hypothermia were that the patient have ROSC and show no return of consciousness (Glasgow Coma Score (GCS) <8). Induction of hypothermia was initiated two to three minutes after ROSC. There was heavy emphasis on avoiding over-ventilation and on attempting to maintain end-tidal CO2 (EtCO2) at a minimum of 40 mm Hg. Patients undergoing MHT were sedated with etomidate, paralyzed with vercuronium and given a titrated dopamine drip to maintain mean arterial pressure (MAP) between 90-100 mm Hg. The mean time to target temperature (34oC) in this study was extraordinarily short: 68 minutes (95% CI 47 to 88); compared to the 2-3 hours typically required to induce MTH. Figure 1-10 (right): Multivariate odds for all factors in outcome evaluated during the Wake EMS study. MTH was by far the most powerful intervention. As in most previous studies of survival factors associated with CPR age and residence (home versus extended care or assisted living facility) had only modest impact on survival. Patients who received bystander CPR 1.79-fold (95% CI 1.18 to 2.72) more likely to survive. Interestingly, all three elements of the Wake EMS protocol were implemented at a cost of less than $200 per patient. Due to budget constraints, Wake EMS chose simple, inexpensive commercial products for refrigeration of IV fluid and implementation of external cooling, as opposed to more costly products developed specifically for medical application, such as the EMCOOLS surface cooling system (Emergency Medical Cooling Systems, AG, Austria). Saline was kept at the requisite temperature of 1-2oC with a compact, 12V operated, consumer travel refrigerator/freezer (Figure: 1-11, Engel-15: http://www.i-m-d.com/) and surface cooling was with generic ammonium nitrate cooling packs. The Wake County EMS program is extraordinary in every way. It represents the best application of the best available technology by arguably some of the best medical and paramedical personnel in the US. The mean time to target temperature of 68 minutes is unprecedented in any clinical study employing MTH. Of the 359 patients who participated in the study (all comers) after MTH was in place; 25 survived. In the subgroup of 93 patients who presented with VF-VT; 34 survived, with 78% or 27 patients being discharged with a good neurological outcome. Put another way 92% of patients who presented under the most favourable circumstances (VF-VT), treated with the best currently available interventions, at the fastest rate of cooling so far reported, failed to survive or did so with profound neurological debility. The primary difference between the survivors and the profoundly disabled or dead was the development of the post-resuscitation syndrome and the primary reason for this complication was not comorbidity, or delay in paramedical assistance, but rather delay in the rapidity of cooling which, if achieved within the first 15 min post ROSC, would have offered the prospect of neurologically intact survival in the range of 70-80% in patients presenting with VF-VT, and 30-40% in all comers. These interventions, remarkable achievements that they are, do not escape from the harsh reality that the 400% increase in survival from cardiac arrest in Wake County, when expressed in absolute terms, means that the number of lives saved increased from ~5 to 25 – out of 395 SCA patients; a huge relative gain, but a comparatively small increase in the absolute number and percentage of lives saved, and minds salvaged. The true life saving potential of MTH remains elusive by virtue of its exceedingly small therapeutic window. Because of this minute therapeutic window, there is a pressing need to achieve rapid and durable core cooling of patients during CPR by simple, easily accessible means. External cooling is only effective at reducing core temperatures by 0.15 to 0.25ºC/min in the average patient undergoing CPR (Figure 1-12) and this is achieved only by complete immersion of patients in a stirred ice water bath. Figure 1-12: Comparison of the cooling rates of four cryopatients. Immediately following pronouncement of medico-legal death patients were given closed chest mechanical cardiopulmonary support and placed in a stirred ice water bath for induction of hypothermia. Epinephrine was administered as per ACLS guidelines; thus peripheral vasoconstriction would be expected to be comparable to that seen in the typical SCA patient undergoing cardiac resuscitation. The most effective external cooling achieved by a commercial system using direct, whole body surface cooling employing circulation of ice water (ThermoSuit,™ Life Recovery Systems, Kinnelon, NJ) is probably the work of Janata, et al., using human human-sized swine. They were able to achieve core cooling at a rate of 0.3oC/min; however it is important to note that the animals in this study were not in cardiac arrest while undergoing CPR in the presence of profoundly peripherally vasoconstricting agents, such as epinephrine or vasopressin; as would usually be the case during ACLS in humans  and which is known to further slow surface cooling. Figure 1-13: The Life Recovery Systems ThermoSuit™ employs direct ice water contact with the patient’s skin to achieve the maximum possible rate of cooling by external means. The system consists of an inflatable insulating and water containment patient enclosure inside of which the patient rests on a mat of Dacron bonded polyester ‘wool’ which acts to diffuse and film water pumped over the dorsal surface of the patient’s body. Water at 2-4oC is thin-filmed over the ventral surface of the body by a thin, transparent blanket with many hundreds of small perforations through which water under pressure pours out and over the patient. 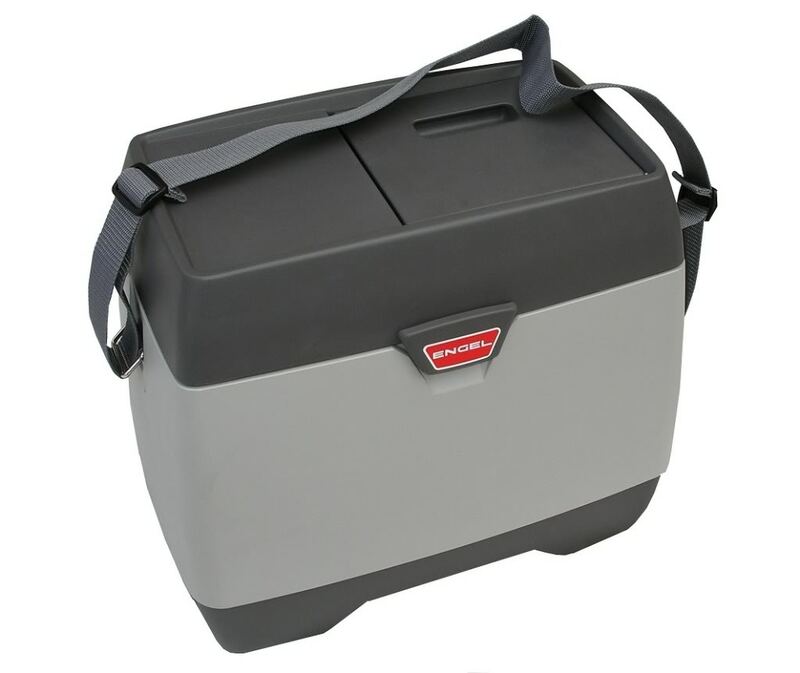 Cold water is recirculated over crushed or cubed ice in an insulated reservoir containing a disposable liner and pumps. Cooling is computer controlled via a thermistor which can be placed in any desired anatomical location. All patient contact items are single-use and disposable (including, as previously mentioned, the pumps) http://www.life-recovery.com/. The obvious problems with this system are its bulk (Figure 1-13), likely high cost, lack of ease in field deployment (again related to its bulk and weight) and the intrinsic physiological problems associated with the induction of hypothermia via external cooling. As extensively discussed in Section Two, the mammalian body consists of multiple thermal compartments transiently ‘isolated’ from each other by differences in blood flow and heat conductivity. Broadly, these compartments can be classified as strongly and weakly circulated (perfused); corresponding to the body core and periphery. The core tissues receive ~63% of the resting cardiac output (CO) but constitute only ~19% of the total body mass. 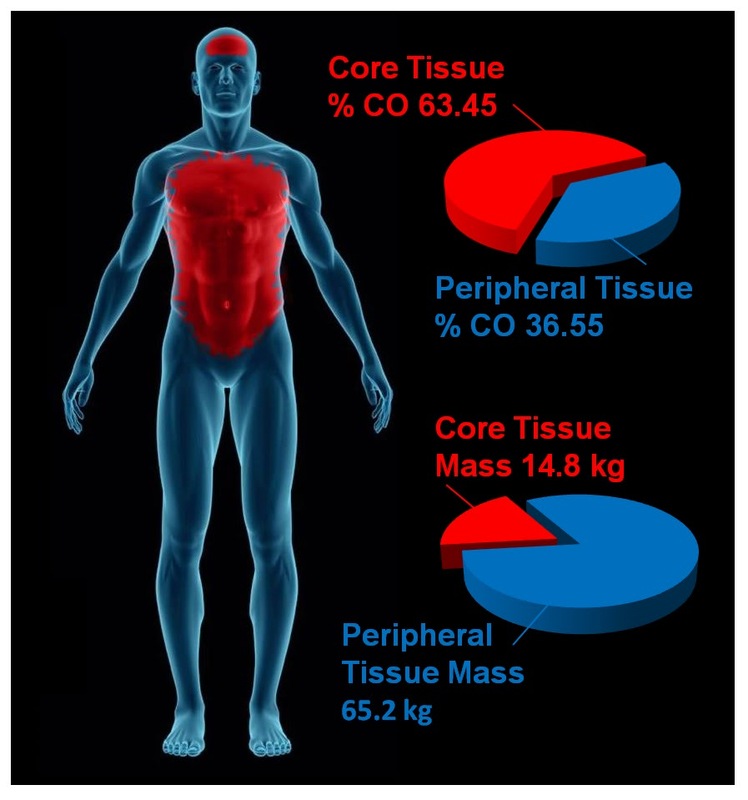 By contrast, the peripheral tissues receive ~37% of the basal CO and constitute ~81% of the body’s mass (Figure 1-14). In humans perioperative minimal hypothermia (MinH) (36oC) increases the rate of wound infections  and prolongs hospitalization. These effects occur in part due to the regional thermoregulatory vasoconstriction MinH induces; which in turn leads to reduced oxygen delivery to injured tissues,  inhibition of oxidative killing by neutrophils,  and reduced collagen deposition. MinH induces significant suppression of mitogenic responses to Concanavalin A (con A), phytohemagglutinin (PHA), and pokeweed mitogen (PWM) and these changes are known to persist for at least 48 h. The mitogens PHA and ConA activate T cells, whereas PWM stimulates both T and B cells, thus indicating that the suppressive effects of MinH involve a variety of lymphocyte subpopulations. Hypothermia of as little as 1oC significantly inhibits production of interlukins (IL-1б, IL-2, IL-6) and TNFα in post-surgical patients,  and this suppression of cytokine production persists for least 24 hours after even a brief post-operative hypothermic interval. The inhibition of pro-inflammatory cytokine production by IL-1б and TNFα induce tissue factor which is critical to angiogenesis, collagen elaboration and fibroblast activation; all essential processes in wound repair and hemostasis.,, Significantly, many of these of adverse effects of post-operative MinH can be prevented by maintaining normothermia in the perioperative period. In the Hypothermia After Cardiac Arrest Study Group, patients treated with MTH experienced twice the incidence of sepsis. This finding is consistent with other studies where MinH and MTH were found to double the rate of post operative wound infection. A recent meta-analysis of MTH for traumatic brain injury (TBI) found that the incidence of pneumonia was also doubled for patients undergoing MTH. External cooling causes greater perturbation in hemodynamics than does central cooling,  resulting in increased systemic vascular resistance and decreased cardiac index; a phenomenon observed in all of the patients in the Bernard, et al., study that employed MTH for post-arrest cerebral resuscitation. This is particularly undesirable in the setting of MI, CHF and cardiogenic shock. For these reasons, as is the case with any potent therapy, careful attention must be paid to the dose-response curve, and overshoot or excessive regional cooling must be minimized or avoided. In patients cooled with ice packs and non-feedback controlled cooling blankets, there have been persistent and extensive problems with overshoot. In one study, 63% of patients overshot to <32oC, 28% to <31oC, and 13% were inadvertently cooled <30oC. By contrast, patients in the European Resuscitation Council Hypothermia After Cardiac Arrest Registry who were cooled endovascularly had less overshoot (mean lowest temperature 32.9oC, IQR; 32.6oC to 33oC) when compared to patients cooled by other methods (mean lowest temperature 32.4oC, IQR: 31oC to 32.9oC). In part, the problem of overshoot in external cooling can be corrected by servo control of patient cooling. However, the fundamental problems of external cooling remain. Excessive cooling of poorly perfused peripheral tissues will inevitably result in ‘after-drop’ of core temperature as thermal equilibration occurs. This process is idiosyncratic and inherently difficult to model or predict. In large measure the speed and character of thermal equilibration between peripheral and central tissues will depend upon highly variable factors such as body morphology and composition, body surface area, cardiac output, regional blood flow distribution, and the administration of vasoactive medication such as ionotropes; with their attendant peripheral vasoconstriction. When the tissues of non-hibernating (or unprepared hibernating mammals) are cooled to £20ºC a wide range of deleterious changes occur. The saturated fats which comprise cell membrane lipids undergo phase change, resulting in red and white blood cell rigidity; with accompanying inability to deform and pass through capillaries. Red cell aggregation also occurs and this, in association with reduced flow as a result of vasoconstriction, results in blood sludging and failure of the microcirculation., Profound hypothermia, either local or systemic, results in hemoconcentration as a consequence of translocation of vascular water and electrolyte to the interstitial space.,,,, This hemoconcentration further exacerbates regional ischemia in deeply chilled tissues. Independent of injury from the freezing of water, moderate, profound or ultraprofound hypothermia is known to cause cellular damage which is referred to as ‘chilling injury.’ Chilling injury appears to be a multifactorial process in which alterations of membrane structure (reorganization of lamellar lipid sheets with lateral phase separation between regions of gel phase and regions of liquid crystal phase result in loss of membrane integrity), , failure of ion pumping (with consequent disruption of cellular ionic homeostasis), , depolymerisation of some elements of the cytoskeleton, , generation of free radicals, , and metabolic disruption due to selective inactivation of critical enzymes  all appear to play a role. Cooling of tissues to 5ºC for as little as 1 hour has been shown to cause microvascular endothelial damage similar to that observed in ischemia-reperfusion injury; loss of endothelial cell tight junctions, infiltration of capillary and venule walls with leukocytes, and frank extravasation of red cells from injured vessels. A possible reason for the similarity in the histological appearance of chilling injury with ischemia-reperfusion injury may be due to the fact that both types of injury appear to be caused, at least in part, by reactive oxygen species and by disruption of the cytoskeleton. Deep cooling of the peripheral tissues may also result in immunosuppresion in chilled limbs and skin, and possibly impaired hematopoiesis due to localized moderate hypothermia in bone marrow in the cranium, sternum, vertebrae, and to a lesser extent, in the pelvis. [In children, the long bones are the principal repository of hematocytoblasts, and this marrow would also be disproportionately chilled during external cooling.] In contrast to the anti-inflammatory effect of MTH, systemic hypothermia to £28ºC, either accidental or induced has been shown to increase levels of pro-inflammatory cytokines. Core cooling is thus the gold standard for the induction of systemic hypothermia (mild, moderate, profound or ultraprofound) and external (peripheral) cooling should be used only where there is no other alternative for achieving truly rapid cooling, or maintaining it for the required 24-48 hours following induction. 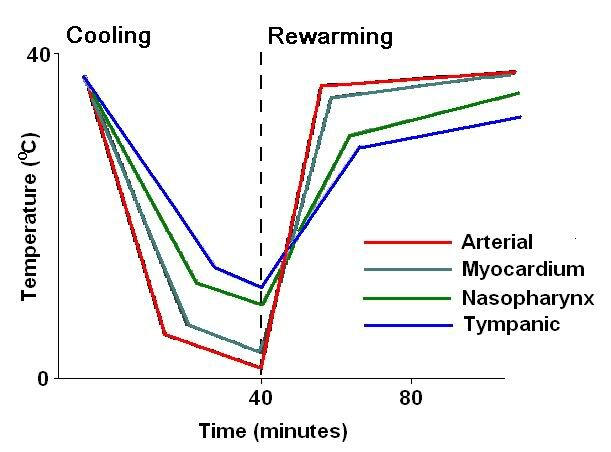 Figure 1-15 (right): Typical (idealized) cooling and re-warming curve achievable with maximum extracorporeal (cardiopulmonary bypass) cooling. The use of emergency CPB applied in this time frame is largely confined to patients undergoing cardiac catheterization and/or revascularization (i.e., angioplasty or stent placement) who arrest in the cardiac catheterization lab. When such patients experience cardiac arrest that is refractory to treatment with drugs and defibrillation – they are usually otherwise healthy – they have normally functioning lungs, normal fluid balance and fluid distribution (are neither dehydrated nor edematous from fluid overload), and have failure of a only a single organ – the heart. Even under such ‘ideal’ conditions, CPR is often inadequate to maintain brain viability during the brief interval between cardiac arrest and the start of CPB. While veno-venous extracorporeal cooling is less technically demanding, it still requires skill-intensive vascular access under field conditions, and reported rates of cooling are modest; ~0.012ºC/min ,. Both of these techniques may require anticoagulation and certainly require coagulation monitoring; which again is a barrier to in-field application. Administration of large volumes (40mL/kg) of chilled intravenous fluid has also been used to reduce core temperature in the field in patients undergoing CPR. However this method is extremely slow (~0.058ºC/min) ,,, and is sharply constrained by the maximum volume of fluid that can be administered. Figure 1-16 (left): Cryopatient undergoing ECMO and blood washout in the home. Even under ideal circumstances cardiopulmonary bypass takes in excess of 30 minutes to initiate. The effectiveness of intravascular fluid administration in achieving durable core cooling is also a function of body composition. Obesity, which has become epidemic in the developed world, is now rapidly becoming a global problem with 1.1 billion adults worldwide classified as overweight,and 312 million of them as obese by the World Health Organization (WHO). Vascular volume does not increase proportionally to increase in body weight; in fact, the vascular volume to body weight ratio falls toward an asymptotic value of approximately 45 ml/kg in the obese human. Thus, the use of cold intravenous infusions will necessarily be even less effective in the obese than might be expected since the maximum volume of fluid that may be safely given does not increase linearly with body weight. Fat is also an extraordinarily good insulator, and obesity often unfavorably alters body surface to volume area. Both of these factors combine to dramatically reduce the speed and overall effectiveness of external cooling. The limits of efficiency of core cooling that can be achieved by irrigating the peritoneal or pleural spaces with cold liquid are in the range of 0.05 to 0.3ºC/min , and both of these techniques are invasive, require considerable technical skill, and carry with them risks of serious iatrogenic consequences. Thus, what is needed for patients who have suffered prolonged (³5 min) cardiac arrest, or in whom ROSC cannot be effectively established, is the ability to rapidly induce hypothermia via core cooling simply and noninvasively. In addition to moderating the injury cascade initiated by ischemia-reperfusion, mild (33-35oC) or moderate (28-32oC) hypothermia can indirectly act to improve gas exchange and hemodynamics by bringing the patient’s cerebral and systemic metabolic demands closer to those that can be delivered by CPR. Closely related in pathophysiology to prolonged normothermic ischemia secondary to SCD is cardiac arrest secondary to exsanguinating trauma. It is estimated that ~20,000 US civilians a year die as result of hemorrhage from abdominal and thoracic injuries , or from poly-trauma. In developing nations this problem is even more severe as a disproportionate amount of trauma occurs in rural settings remote from tertiary care facilities; and with no helicopter or other airlift infrastructure available to shorten this interval. Cardiac arrest secondary to exsanguinating trauma offers a unique opportunity for intervention in the pathophysiological cascade of cardiac arrest. Because blood loss and deterioration of the patient to the agonal state occur over a time course of minutes, to an hour or longer, it is possible to begin induction of hypothermia before cardiac arrest occurs; potentially allowing for the opportunity to prevent many of the foreseeable irreversible pathological events which occur during ischemia as a result of cardiac arrest. As is the case with truly effective implementation of MTH in cardiac arrest or neurotrauma the barrier to EPR is safe, rapid and easily implemented core cooling. One possible solution to this problem is to use the lungs as a heat exchanger. Yet another constraint on the use of gases for heat exchange in the lungs of most vertebrates is their tidal, bi-directional scheme of ventilation which results in admixture of inspired and expired gases and sharply constrains the maximum flow rate of gas per unit of time (minute volume) ‘through’ (i.e., in and out of) the lungs. By contrast, the lungs of birds employ a unidirectional, flow-through approach to ventilation (circulatory lungs) which is more efficient at gas exchange and allows for higher peak minute volumes. The final constraint on using gases is the necessity of keeping the temperature of the gas (or other heat exchange medium) at or above 0ºC in order to avoid freezing damage to the tissues or provoking broncho-constriction which interferes with both gas and heat exchange. This sharply limits the ΔT, which will also decay steadily as the temperature of the patient decreases towards 0ºC. The only solution to the heat exchange limitation imposed by gases is to replace the tidal gaseous breath, or some fraction of it, with an appropriate liquid. This is a formidable challenge because the respiratory systems of air breathing animals have evolved complex and delicate systems to facilitate gas exchange; and these systems are incompatible with the presence of bulk liquid in the airways. Figure 1-17: Anatomy of the acinus. 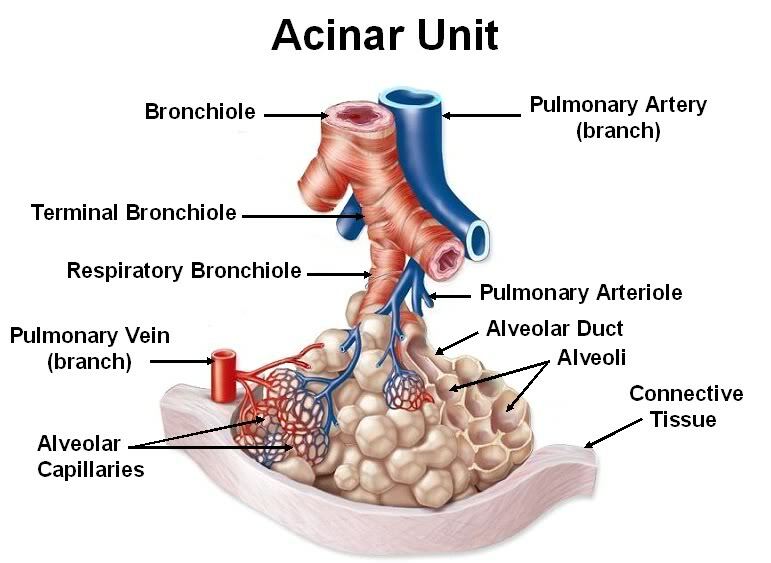 Anatomically, alveoli are not independent structures but rather have common walls and are organized around and attached to the terminal bronchiole. This unit of structural organization is the acinus. The acinus is reinforced with both comparatively rigid (collagen) and elastic (elastin) fibers and the arrangement of the alveoli in a honeycomb-like manner within the acinar unit provides added structural stability and give the acinus emergent properties similar to those of foam. The structural features of the acinus, acting in concert with surfactant (which lowers alveolar surface tension providing additional architectural stability), is termed interdependence. 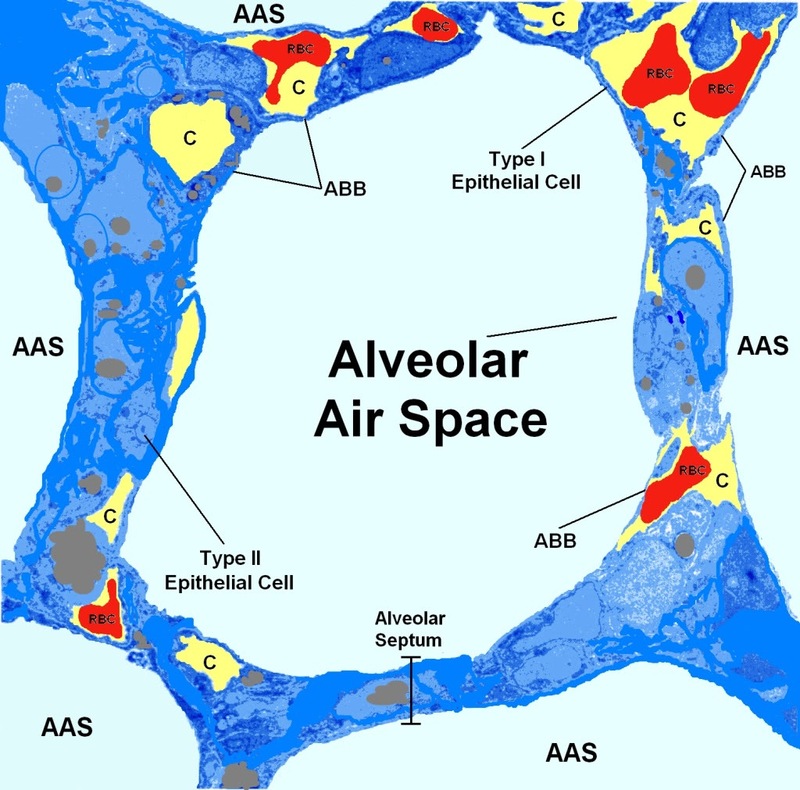 Interdependent structural stabilization of the alveoli maintains alveolar volume and surface area fairly constant during ventilation under normal conditions. In lung injury, even the collapse of a single alveolus in an acinus causes shear stress – not only in the walls of the collapsed alveolus, but also in the walls of the adjacent alveoli (see Figure 4-11). The shear stress that develops under such conditions may exceed 140 cmH20, and the stabilizing interdependence of the acinus is lost, with the alveoli increasingly behaving as independent units that change volume dramatically with each tidal cycle. The smallest gas exchange units of the mammalian respiratory system, the alveoli, are a mere ~125 µ in diameter and, absent molecular reinforcement in the form of surfactant, are inherently unstable and collapse. Surfactant has evolved to function as a semi-aqueous thin film lining the alveolus and other small acinar structures (such as the terminal bronchioles and the alveolar ducts) (Figure 1-17) and it is dissolved, damaged, or inactivated when exposed to water, and to other molecules typically found in body fluids such as proteins and lipid particles. Surfactant has both hydrophilic and lipophylic components which impose the seemingly impossible constraint that any liquid introduced into the lungs must be both hydro- and lipophobic, as well as virtually completely chemically inert. So far, only one class of compounds, the perfluorocarbons (PFCs), meets these requirements. 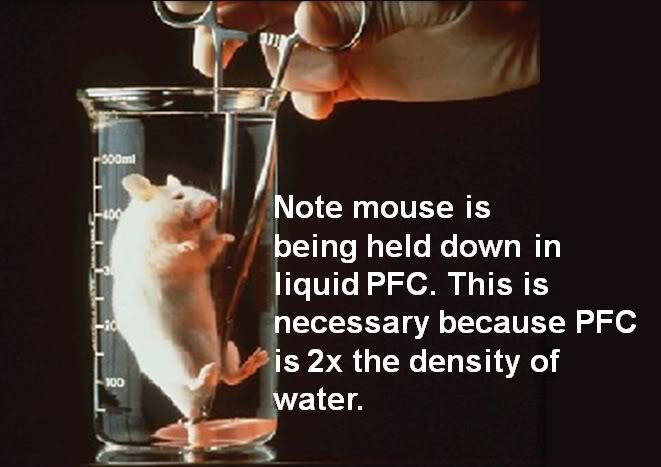 With the demonstration in 1966 by Clark and Gollin that mice could survive extended periods of ‘liquid breathing’ with the PFC FX-80 (FC-75; perflurotetrahydrofuran) the feasibility of using liquids as gas exchange media began to be explored. Despite the (in retrospect) painfully obvious implication that PFCs could be used in the lungs for heat exchange as well as gas exchange, the idea did not occur to the author until sometime between the winter of 1993 and the spring of 1994. This happened while rereading Guyton’s Textbook of Medical Physiology during the course of several transcontinental flights across the United States (US). The author had been aware of Leland Clark’s ‘fluorocarbon breathing mice’ since shortly after these experiments were carried out in 1966; they were the subject of extensive media coverage, including dramatic footage shown on science-oriented television programs of the time (such CBS’ ‘The 21st Century’). Yet, it was not until re-reading Guyton’s chapter on respiratory physiology that the idea of using the lungs as a liquid-based heat exchanger became clear. Having spent literally 22-years obsessed with the problem of how to rapidly, non-invasively, and relatively simply, induce hypothermia in humans under field conditions; in hindsight it seems utterly obvious to use tidal liquid ventilation (TLV) employing a refrigerated PFC as a way of achieving rapid, homogenous, systemic cooling. Figure 1-18: Mice can briefly tolerate breathing the PFC FC-77 but soon succumb to exhaustion from the work of breathing and hypothermia from the ambient temperature liquid. An investigation of the literature disclosed the feasibility of TLV based on the work of Shaffer and his colleagues. Unfortunately, acquiring a PFC suitable for liquid assisted ventilation was very problematic. The only commercially available PFCs at that time were the 3M Fluorinet™ fluids and Rimar-101 (the latter manufactured by the Miteni Corporation in Milan, Italy). Neither company distributed their products through the conventional chemical houses. The reason for this was that both 3M and Miteni specifically embargoed the sale of their PFCs for any research application involving biological systems – and in particular any application that involved liquid assisted ventilation (LAV) or O2 carrying blood substitutes (oxygen therapeutics). By January of 1995, the author and Respiratory Therapist Michael Fletcher had constructed the first TLV ventilator for research into inducing MTH during CPR, with the idea very much in mind that this technology had tremendous potential for broad medical application (post resuscitation syndrome, stroke, subarachnoid hemorrhage (SAH) and possibly traumatic brain and ischemic (and traumatic) spinal cord injury (TBI and SCI). 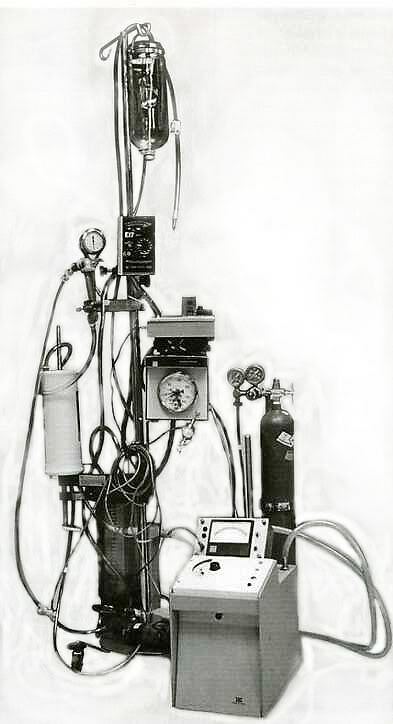 Figure 1-19: The first TLV apparatus for cardiopulmonary cerebral resuscitation-related research (left) used blood as the gas exchange medium. The device used a bubble oxygenator and heat exchanger and relied on gravity to provide ‘exhalation’ drainage from the lungs. The inspiratory roller pump and the timing and pressure controller functioned well, but blood proved to be too injurious to the lungs t serve as a gas exchange medium. 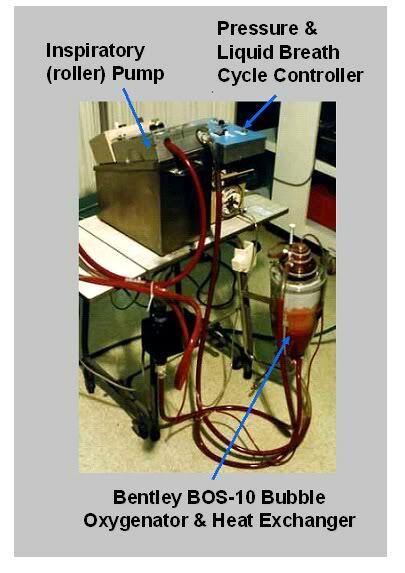 These experiments made the need for an expiratory pump obvious. Photo: circa February, 1995. Because of the unavailability of PFCs, and because of the prior liquid breathing research by Johannes Klystra ,, which demonstrated that mammals could survive after breathing a balanced salt solution under hyperbaric conditions (where gas solubility in water is dramatically improved), we decided to use bovine blood as the gas exchange medium in a non-survival canine model of TLV. Blood, unlike saline, has the proven capacity to deliver and exchange an adequate amount of O2 and CO2under normobaric conditions. A review the literature (then and now) indicated that this had not been attempted, or apparently even proposed. These two initial experiments using bovine blood in an acute canine model of TLV demonstrated that blood was not suitable for use, and that TLV was a demanding technique that required an exhalation pump in addition to an inspiration pump. The prototype device taught us a great deal, and in fact, the control unit from that first TLV ventilator was used until 2000 to conduct much of the early 21st Century Medicine, Inc., and Critical Care Research, Inc., work on liquid assisted pulmonary cooling (LAPC). 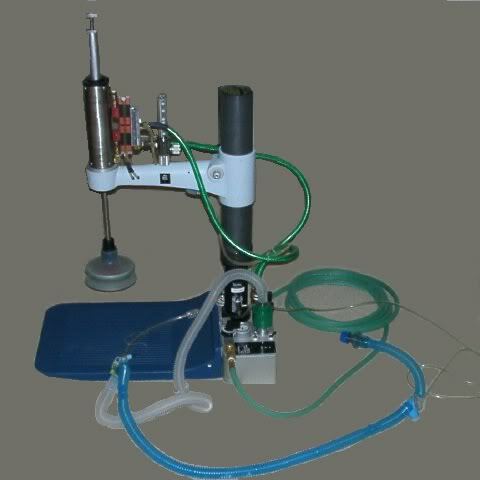 Dynamically sensing and controlling the amount of PFC in the animals lungs proved problematic with this system, and despite a very high predicted minute alveolar ventilation rate (with 80 to 100 liquid ‘breaths’ per minute from chest compression-decompressions), and minimal anatomical dead-space (the tip of the liquid delivery catheter was at the level of the carina), hypercarbia developed after the first 10 to 15 minutes of ventilation. While survival of animals following TLV using PFCs was 100%, with a low incidence of adverse effects (providing TLV was discontinued prior to lethal levels of hypoxemia), the logistics of applying TLV to a field-setting under emergency conditions was deemed insurmountable. This was particularly true in the mid-1990s due to limitations on both portable computing power and the lack of adequately miniaturized and lightweight sensing and servo-control technology. During the fall of 1996, the author learned of the development and initial clinical application of a new technique of liquid assisted ventilation (LAV) called partial liquid ventilation (PLV) which was being used to treat respiratory distress syndrome in (primarily) premature infants. 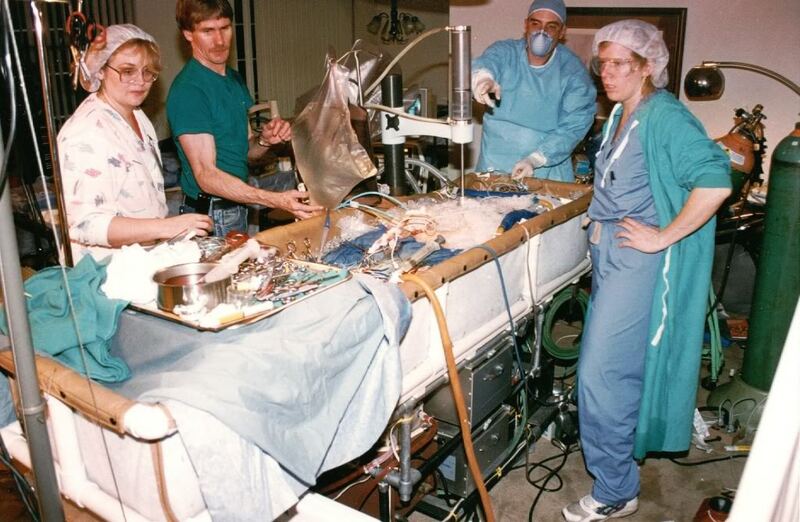 This work was rapidly extended to include adults, and in the Spring of 1996 the author attended a three-day conference and workshop: the ‘Basics of Liquid Ventilation Management of Severe ARDS, ECMO, Liquid Breathing and PCIRV Conference’ in Ann Arbor, MI. In contrast to TLV, PLV was effected by simply adding PFC to the patient’s respiratory system until it was filled to functional residual capacity (FRC, ~30 ml/kg) while continuing conventional mechanical ventilation with gas; PLV was the essence of simplicity PFC was added to the endotracheal tube with a syringe until the desired volume was given or a meniscus of PFC appeared at the desired level in the ET tube. What is more, as the author had already observed while rounding at the University of Michigan Medical Center’s ICU, due to their unique physical properties, PFCs had the ability to rapidly reverse the hypoxemia and hypercarbia that accompany respiratory distress and its attendant pulmonary edema. Thus, PLV offered the added promise of restoring adequate gas exchange in fulminating pulmonary edema, as well as serving as a safe and effective heat exchange medium. Early in 1997, due to the technical and logistic difficulties imposed by TLV, the author began to investigate the use of multiple lavages of the lungs in dogs using PFC chilled to ~4ºC. In this technique the animals’ lungs were filled with ~4 ºC PFC to vital capacity (VC, 60-70 ml/kg) following which the PFC was suctioned out and this process was repeated with additional loads of ~4ºC PFC until the desired core temperature was reached. While technically straightforward and very simple in application, this approach required large amounts of chilled PFC and had the obvious potential to interfere with gas exchange under conditions of hyper-metabolism, oxygen debt, or hypercarbia. Additionally, the time required for loading and suctioning out 60-70 ml/kg of PFC did not appear to be consonant with maximizing heat exchange, given that much of the PFC load would necessarily remain in the large and intermediate sized airways, where heat exchange is very slow compared to in the alveoli. At this point it became apparent that a practical, field-applicable method of inducing hypothermia by PFC lung lavage would involve a hybrid approach, wherein both liquid and gas tidal ventilation would have to proceed simultaneously, or on a rapidly alternating basis. This work was largely set aside at that time (1997) due to a research commitment to develop a multi-modal method of dealing with ischemia-reperfusion injury attendant to prolonged cardiac arrest. This model involved the use of multiple drugs, as well as the rapid (~15 minutes) induction of mild post-insult hypothermia using the Safar, et al.,  model canine model of cardiac arrest and resuscitation, which employed CPB for the induction of hypothermia. Figure 1-18 (above): The alveolar capillary unit is the fundamental repeating structural unit of the lung. Above is a schematic rendering of an alveolus as it would appear magnified ~3,000 times. The polyhedral alveolar air spaces (AAS) are separated from each other by the alveolar septa which are ~15µ thick. The Type I epithelial cells overlay the capillaries (C) and constitute the air side of the airway-blood barrier (ABB). The capillaries are the yellow spaces with the red blood cells (RBCs) inside them. The Type II epithelial cells are heavily vesiculated and secrete surfactant which maintains the structural integrity of the alveoli and prevents them from collapsing during exhalation. The total thickness of the ABB is only ~0.5µ which means that heat exchange between blood and PFC at the alveolar wall is extremely rapid – the rate limiting factor on heat exchange is, in fact, the rate at which PFC can be moved into and out of the alveolus. With the success of this post-resuscitation hypothermia and multi-drug research cerebral resuscitation model in 1998, it became important to demonstrate that very rapid, in-field induction of hypothermia was technically and logistically possible. A decision was made to return to the LAPC research in order to validate the feasibility of this approach for immediate, simple, post-arrest induction of MTH (~34 ºC).The first results of the work were presented in1999 at the 28th Educational and Scientific Symposium of the Society of Critical care Medicine in San Francisco, CA. At the time, it was anticipated that completion of the research would take approximately 6 months. The team that began this work consisted of the author, Steven B. Harris, M.D., Sandra Russell, BS, Michael Fletcher, R.T., Joan O’Farrell and Brian Wowk, Ph.D. 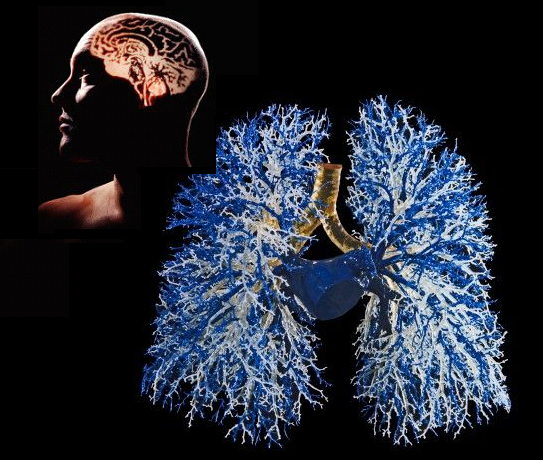 This project proved more formidable than initially anticipated and ultimately consumed over 2 years of full-time effort in order to develop the core elements of a workable technique, and achieve a basic understanding of the physiology and pathophysiology of fractional tidal liquid assisted pulmonary cooling (LAPC); the technique that was ultimately developed. This team worked together seamlessly to establish the effective volumes of PFC to be loaded and unloaded (i.e., fractional liquid tidal volumes), optimum dwell times for PFC, tolerable peak and mean airway pressures for ventilation during liquid cycling, workable gas ventilation strategies, and the basic mechanics of both heat and gas exchange using this technique. Reduces inflammation and lung injury. 1) All of the blood that flows out from the heart to the body flows through the lungs first, where it is oxygenated and carbon dioxide (CO2) is removed. In order to facilitate gas exchange, the architecture of the lungs has evolved to provide an enormous surface area combined with an ultra-microscopic barrier between blood and air. The alveoli, the gas exchange units of the lungs, are polyhedral compartments ~250 µ in diameter which branch out from the terminal bronchioles (which are about twice the diameter of an alveolus; 250µ) (Figure 1-18, above). Each adult human lung contains ~300 x 106 alveoli with an aggregate surface area of 140 m2  The alveolar epithelium is comprised of two types of cells; Type I epithelial cells that constitute the alveolar side of the air-blood barrier (ABB) and Type II epithelial cells which are intercalated in the epithelial lining and secrete surfactant. The Type I epithelial cells are so thinned out where they cover the capillary endothelial cells (which are even thinner) that the composite thickness of both cell layers and the basal lamina is ~0.5µ. These unique anatomical features of the lungs, combined with the physiological fact that they process all of the cardiac output, makes them ideal as a heat exchanger. 2) As previously noted, air, oxygen and other gases make extremely poor heat exchange media since they are roughly a thousand times less dense than water, they will remove heat at only roughly one thousandth the rate. This technique of non-invasive in-field induction of hypothermia using the lungs is called liquid assisted pulmonary heat exchange (LAPHE), or liquid assisted pulmonary cooling (LAPC) when used for inducing hypothermia. Pharmacologic State Committee on 24, June 1999. The author rejects the conventional designation of ‘sudden cardiac death’ because it is inaccurate; death is, by definition, the irreversible loss of life. Acute cardiac arrest is not death and the nomenclature used to describe it should reflect that fact. Data on cooling of humans during CPR is, of necessity, derived from the human cryopreservation program; implemented in the United States starting in 1967 as a controversial effort to achieve a form of ‘medical time travel’ for individuals experiencing medico-legal, but not biological death. e.g., Sigma, Fluka, Fischer, Mallinkrodt, Spectrum, Baker, etc. Basics of Liquid Ventilation Management of Severe ARDS, ECMO, Liquid Breathing and PCIRV Conference, Ann Arbor, Mi, March 8-9, 1996. This entry was posted in Cryonics Technology (General), Ischemia-Reperfusion Injury, Medicine and tagged cardiac arrest, cardiiopulomnary resuscitation, cerebral resuscitation, cerebral resuscitration, CPR, cryonics, liquid breatrhing, liquid ventilation, neurosalvage, perflurocarbons, reanimation. Bookmark the permalink.